I was working on my OBIEE Test Lab today. Having network issues, because I'm prone to those. I decided to look up The Fat Bloke as he seems to be the resident expert on all things VirtualBox. As to my network issues, The Fat Bloke had this great post back in June, which helped me understand how VirtualBox network interfaces work. So, as I said, I was looking for some new articles. 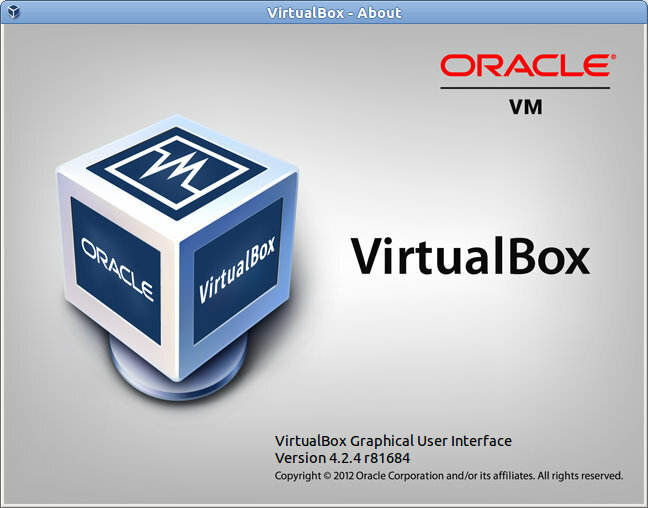 I ran across this one, What's New in Oracle VM VirtualBox 4.2?. There was this section on Groups. I tried it out on mine...it didn't work. I check my version, 4.1.something. Hmmm. The article was dated September. I should have this. No sooner did I think that, I got an update message from VirtualBox saying a new release was available. Sweet! Groups allow you to organize your VM library in a sensible way, e.g. by platform type, by project, by version, by whatever. To create groups you can drag one VM onto another or select one or more VM's and choose Machine...Group from the menu bar. You can expand and collapse groups to save screen real estate, and you can Enter and Leave a group (think iPad navigation here) by using the right and left arrow keys when groups are selected. But groups are more than passive folders, because you can now also perform operations on groups, rather than all the individual VMs. So if you have a multi-tiered solution you can start the whole stack up with just one click. Very cool stuff. 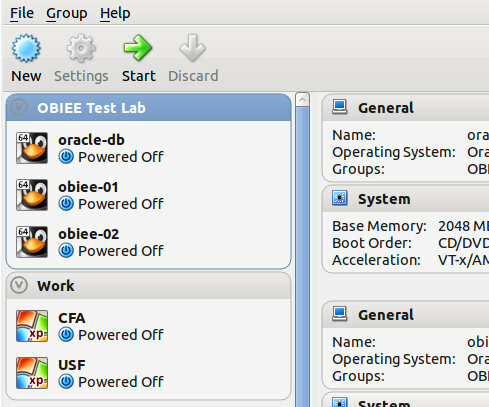 Now I can logically group my OBIEE Test Lab VMs. If I ever get around to having the software (database, OBIEE) start automatically, I'll be rocking. Lots of cool new stuff there. Read the article and go get the software. 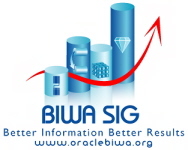 If you're looking for a good BI/DW/Analytics focused event, check out the BIWA Summit which takes place in January of 2013. If you're interested in speaking at the event (and you know you are), hurry up and get your abstract in here, it closes tomorrow (November 9th). Day 1 will give us Tom Kyte who will talk about What's new from Oracle in BI and Data warehousing. Day 2 will feature Vaishnavi Sashikanth, Vice President, Development, Oracle Advanced Analytics at Oracle who will speak on Making Big Data Analytics Accessible.